Kerala State Road Transport Corporation or KSRTC is the state-run bus company in the state of Kerala. It is one of the oldest state run public bus transport services in India. KSRTC is a Public Sector Corporation under the Ministry of Transport of the State Government of Kerala. This Kerala Public transport bus service was started in 1938 with headquarters in Thiruvananthapuram. It is one of the oldest state run public bus transport services in India. Garuda Volvo AC Bus: Interstate Services Luxury Buses to Bangalore with 2×2 reclining seats and full air suspension. Super Deluxe Airbus: Luxury interstate and intrastate services, often long distance with 2×2 reclining seats and rear air suspension. Super Express Airbus: Newly introduced long distance services on 12 m chassis, often interstate with 3×2 seating layout with more leg room and rear air suspension. Some buses have 2×2 seating layout. Same fare as a Super Express. Super Express: Faster, long distance services, often interstate with 3×2 seating layout. Super Fast: Fast, long distance services with 3×2 seating layout. Super Fast Airbus: Converted old TATA 1616c Luxury buses, often long distance with 2×2 seats more leg room and rear air suspension. Same fare as a Super Fast. Fast Passenger: Short and long distance no frill services with 3×2 seating layout. Oridinary Bus: Short routes served by older buses that used to run on higher grade services. Venad/Malabar Limited Stop: Comfortable buses used as Limited Stop Ordinary [LS ORD] / Fare Stage Limited Stop [FSLS] / Town to Town [TT] with 3×2 seating layout and Ordinary Fare Stage. Ananthapuri Fast / Thiru Kochi: City buses in Thiruvananthapuram / Kochi with 2×2 seating layout. City Ordinary Bus: Ordinary Buses in Thiruvananthapuram for city transportation. City Double Decker: Double Decker buses in Thiruvananthapuram (EAST FORT to SANGUMUGHAM Beach)charging ordinary fares. JnNURM AC Volvo Low Floor: Low Floor AC City Buses under Jawaharlal Nehru National Urban Renewal Mission scheme in Thiruvananthapuram / Kochi with 2×2 seating layout. JnNURM Non AC Low Floor: Low Floor City Buses under Jawaharlal Nehru National Urban Renewal Mission scheme in Thiruvananthapuram / Kochi with 2×2 seating layout. Mini Bus: Mini Buses are used on small feeder routes charging ordinary fares. Short Wheel Base Ordinary Bus: Midi Buses with shorter wheelbase (176 in wheelbase) are used on routes in hilly areas, ghats and small narrower roads charging ordinary fares. Rs 30 for Luxury/Hi-tech/Air Conditioned/Volvo Services. – This will get a list of 20 buses with their timings on that route. To succeed by providing excellent service to the customers through a committed team, Kerala State Road Transport Corporation is gaining popularity for their dedicated work and non-stop services. They are loyal to provide a high standard of service to all the customers through the development of the services. 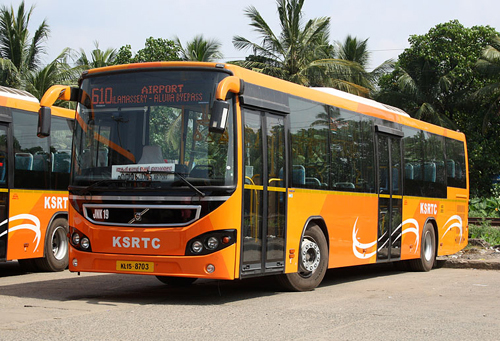 KSRTC Workshops and Depots are widely spread around the whole of the state of Kerala. There are depots, sub depots, chief office, workshop centers and many other operating centers present to make the service more convenient for the public. Let android aside, first let them develop the system to book tickets online for all the routes. At present booking is to be done at the site only, and veryfew buses have come online.